It's amazing how many people think they're in the know when it comes to Arsenal's transfer business. An example I'd give is a person on twitter saying the club will be very busy next week in the transfer market and a signing will be announced on Monday or at least by the end of the week. Talk about pie in the sky guessing. The truth is no one knows what Arsene Wenger is planning. Not even his own staff and players. Yes, they might have inklings that something's going to happen but until Wenger decides he's going to make a move, only a small amount of people hear the manager's true thoughts on which players he wants to bring to the club. Agents and other interested third parties love to talk to the media and plant a story about player x being interested in moving to club z but you wonder whether that's because they are trying to talk up the interest in the player and thereby increasing the transfer fee to maximize their cut of the deal. Remember in the last few weeks how rumours started circulating about Karim Benzema moving to Arsenal? Might that rumour have been started because an agent planted a question with the French journalist interviewing Arsene Wenger? It appears now the France international will be staying at Real Madrid but look how easily that situation escalated to a position where a fee of £20m was being discussed. Anyway, as the manager is being "welcomed like a rock star" in Minsk where he's working for French TV covering France's international game with Belarus, very little will happen this weekend. Which links nicely with the news and the words spoken by Nicklas Bendtner in the Danish press about his future with Arsenal. As we heard from his father, he wants to move on. And now the man himself has said what we all knew already. "I am fully resolved that I must get away from Arsenal. I've considered it for a long time and was quite clear when I took it. So it does not feel especially weird that I do not know what the future brings. I'm quite calm and confident that we will be fine in a new club." As regular readers will know, I like Bendtner and think he'll turn into a excellent player. His abilities haven't been utilized at Arsenal and playing him on the right hand side of attack doesn't get the best out of his game. So it seems like we'll be saying farewell to the big Dane, but only when we receive an acceptable offer. And I'm not talking £12million his father expects us to snap up. One thing I've learnt from the article is Bentdner's son is called Nicholas. I just find it weird parents who give their children the same first name as themselves. Albeit, Bendtner has changed the boy's spelling. 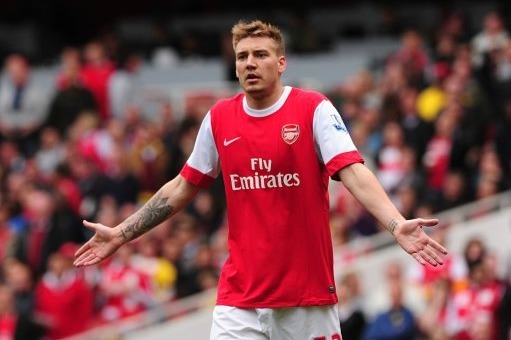 With Bendtner off, don't expect a signing before he's sold. That's not the Arsenal way of doing business. The Daily Mail think we're going to go for West Brom's Peter Odemwingie for £4million. The Nigerian international is going into the final year of his contract at the Hawthorns, so it could be a goer. A transfer rumour I've placed in the FOUPS (File Of Uninspiring Possible Signings) is Arsenal's supposed interest in Blackburn Rover's central defender Christopher Samba. However I'm happy after reading his quotes in a story from the Lancashire Telegraph because it appears like he' preparing himself for another season with Rovers. I'm not popping the champaign cork yet though. There is still a long summer ahead of us. And whilst we're on the subject of long summers, it appears the interest in Cesc Fabregas is just starting to warm up with the news that Real Madrid have been told any opening bids for our captain need to be in the region of £54m, according to The Sun. Also in The Sun is news that Brighton are interested in taking Henri Lansbury on loan next season. Personally I'd like to see him stay at Arsenal and fight for his place in the first team squad. I really think he could offer us something different. Jack Wilshere has been trying to persuade Gary Cahill to sign for Arsenal during their game of golf yesterday. I hope his tapping up worked. Their game with the irons came after our midfielder was tested for drugs. I'm certain that result to come back clean. Yes, like Messi, Jack is really that good and doesn't need to take drugs to enhance his performance. According to Goal.com we're looking at a partnership with Belgian club Anderlecht. And finally, I really love Robin van Persie and his refusal to not say what he thinks about opposing teams and their tactics, even if that means he'll be unpopular with the fans of opposing teams. "Chelsea players are always bitching against the referees. I really cannot understand that. Just shut the f*** up and focus on playing football." "The Barcelona players nag about everything that happens on the pitch. I was disappointed with that." I love how refreshingly honest he is. If only all footballers could be that way.